In 1935 Sheffield Wednesday claimed the FA Cup at Wembley with a 4 – 2 victory over West Bromwich Albion. West Brom went into the match as pundits favourites, despite being below Wednesday in the league. Many pundits were of the opinion that West Brom had the best forwards, with three of their strikers having notched up more than 20 goals each during the season. However Jack Palethorpe, Mark Hooper and Ellis Rimmer (2) proved the pundits wrong, with Ronny Starling putting in a captains performance despite missing one chance, and having an effort of his own cleared off the line. 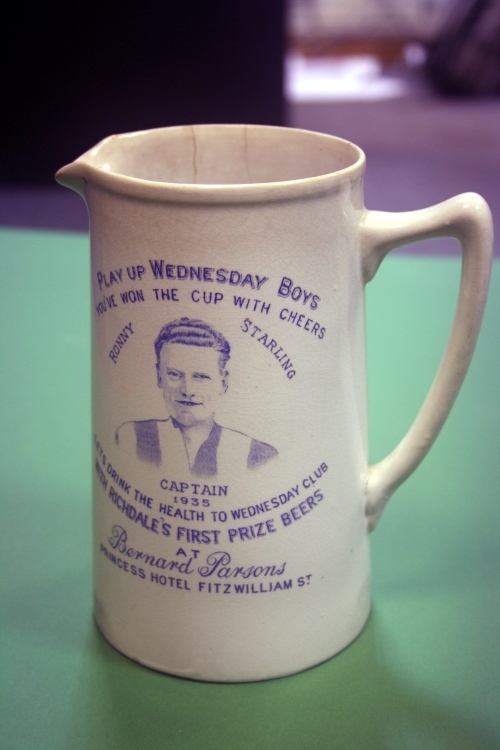 Starling is featured on this original ‘Play Up Wednesday Boys’ jug/tankard featured below which commemorates the win and is part of our collection.